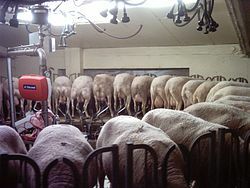 Lacaune dairy sheep in rotary parlour, Aveyron, France. Sheep's milk (or ewes' milk) is the milk of domestic sheep. It is commonly used to make cultured dairy products such as cheese. Some of the most popular sheep cheeses include feta (Greece), ricotta (Italy), and Roquefort (France). In the U.S., the most common dairy breeds are the East Friesian and the Lacaune. Finding a dairy sheep producer can be challenging, so some may choose a meat or wool breed, which do not produce as much milk as a dairy breed, but produce enough milk to create small amounts of cheese and other products. Female sheep (ewes) do not produce milk constantly. Rather, they produce milk during the 80–100 days after lambing. Sheep naturally breed in the fall, which means that a majority of lambs are born in the winter or early spring. Milk production decreases and eventually stops when lambs are weaned or when the days become shorter. This means that milk cannot be produced year round. Through the use of controlled internal drug release (CIDR), ewes can be bred out of season. CIDR drugs contain progesterone, which is slowly released into the bloodstream, bringing the animal into estrus. In this way, ewes can be bred at different times throughout the year, providing farms with a year-round supply of milk. Meat and wool breeds of sheep lactate for 90-150 days, while dairy breeds can lactate for 120-240 days. Dairy sheep are able to produce higher yields of milk per ewe per year. Dairy sheep can produce 400-1100 lbs of milk per year while others sheep produce 100-200 lbs of milk per year. Crossbred ewes produce 300-650 lbs of milk per year. Sheep milk cheeses include the feta of Greece, Roquefort of France, Manchego of Spain; Serra da Estrela from Portugal; pecorino Romano (the Italian word for sheep is pecora), pecorino Sardo, and ricotta of Italy; Pag cheese of Croatia; Ġbejna of Malta; and Gomolya of Hungary; and Bryndza (Slovenská bryndza from Slovakia, brânza de burduf from Romania and Bryndza Podhalańska from Poland). Yogurts, especially some forms of strained yogurt, may also be made from sheep's milk. Sheep milk is extremely high in fat and conjugated linoleic acid (CLA) compared to other milk producing species. There is also a large amount of solids present in the milk. This makes sheep milk an excellent choice for making cheese and it produces higher yields of cheese compared to other milk producing species. One liter of sheep milk will produce a far higher amount of cheese than one liter of cow milk. ^ "Assaf sheep - Wikipedia". en.m.wikipedia.org. Retrieved 2017-11-18. ^ a b c Berger, Yves (2010). "Guide to Raising Dairy Sheep" (PDF). ^ "Using Sheep CIDRs - Premier1Supplies Sheep Guide". Premier1Supplies Sheep Guide. 2012-10-15. Retrieved 2016-11-25. ^ Sinanoglou, Vassilia (2015). "Assessment of lactation stage and breed effect on sheep milk fatty acid profile and lipid quality indices". Journal of Dairy Science and Technology. 95: 509–531.